This poster Monday spot of the day goes to José Fresan from Mexico City for his poster La Femme. Jose is always trying to find which have meaning, that speaks about himself, his feelings and points of view, that’s what he enjoy the most about graphic design, finding projects where can express an inner part of himself. 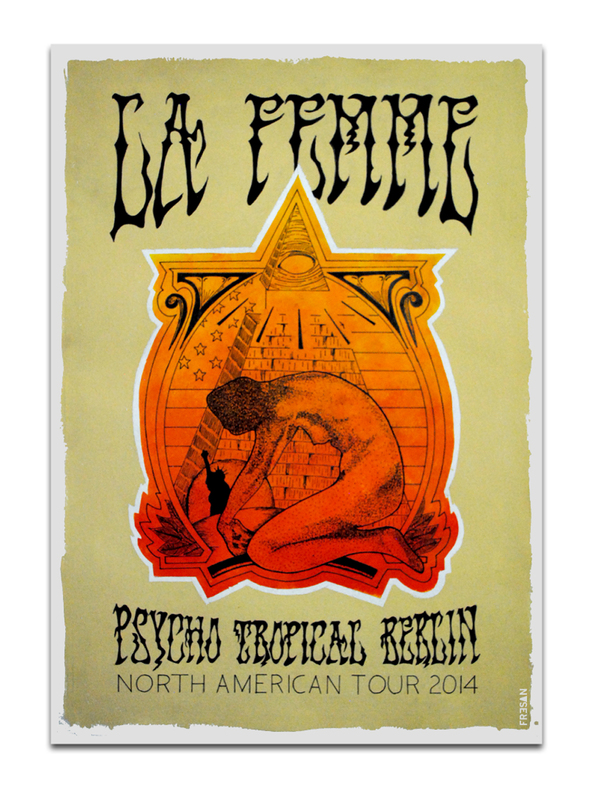 The poster featured here was created for La Femme, a psych-punk rock french band. They released their debut album in 2013, starting their world tour in 2014. Going to America for the second time was an important tour for them since it meant promoting their album all across the country. Fresan met the members of the band the first time they played in Mexico City. The concept behind the poster is related to them taking over America with their psych-rock surf style but also at the same time becoming part of it. The poster expresses this concept with the use of American symbols, such as the Statue of Liberty, the Eye of Providence and even the stars and stripes on the background. The central element of the poster is the silhouette of a woman that makes reference to the name of the band. Put together these elements bring the poster to live.